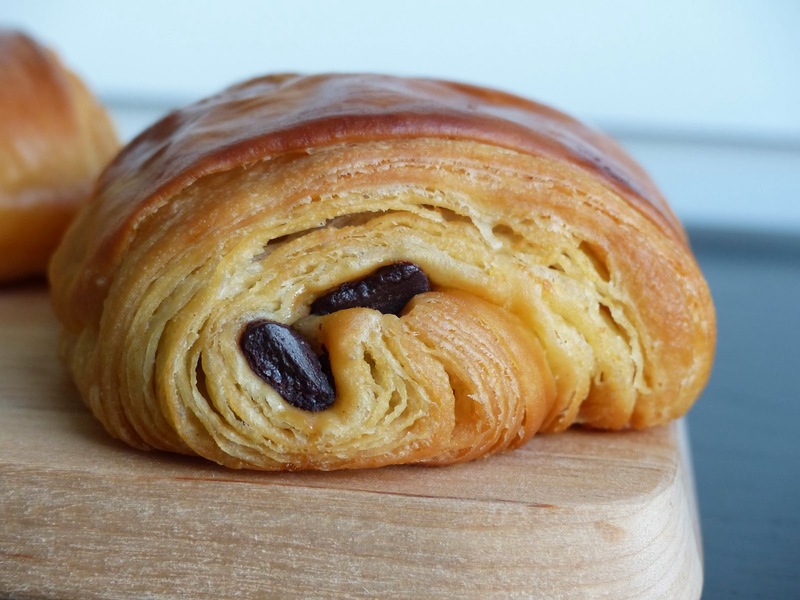 I was super excited about this recipe, because pain au chocolat is my ultimate favorite pastry ever. In fact, to research for this week, I sampled a few selections from local bakeries. I must say, there's nothing quite like a fresh, still warm from the oven, homemade chocolate croissant. It beats all others, hands down. This dough acted differently than the first time I made it. I'm not sure why, but it seemed stickier and more yeast-y, if that's possible. Maybe because it was raining when I made it, the extra moisture in the air could have affected it. It was more difficult to roll out and work with, but I managed. Like last week, I wasn't able to roll it out as big as the recipe said, so I got 16 croissants instead of 20. Also, the instructions for how to cut the rectangles were a bit confusing, so I just guessed and it turned out ok.
Rolling the chocolate sticks up into the dough was easy, and they rose quite a bit before baking. The double egg wash worked again, making the finished croissants golden brown. I must remember that trick and use it from now on. I let the croissants cool just enough so I could pick them up, and then had to sample one. The chocolate is so rich and creamy, very decadent. Whereas I could easily devour two or three plain croissants at once, these are so rich that one is enough. 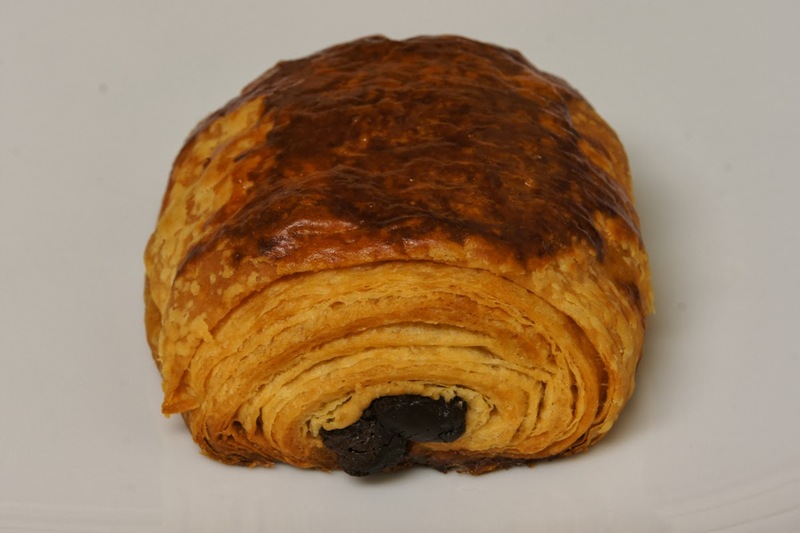 I always hate when I get a pain au chocolat and the chocolate inside is hard and crumbly. These were perfect! Even better when heated up a bit the next day. As with the previous croissant recipe, these would be great to make a batch of and freeze half for another day. In fact, I'm kind of wishing I had done that, so I could eat one right now. Everything worked out exactly as described, and it would have been frustrating to put in all that work and have something not turn out correctly. 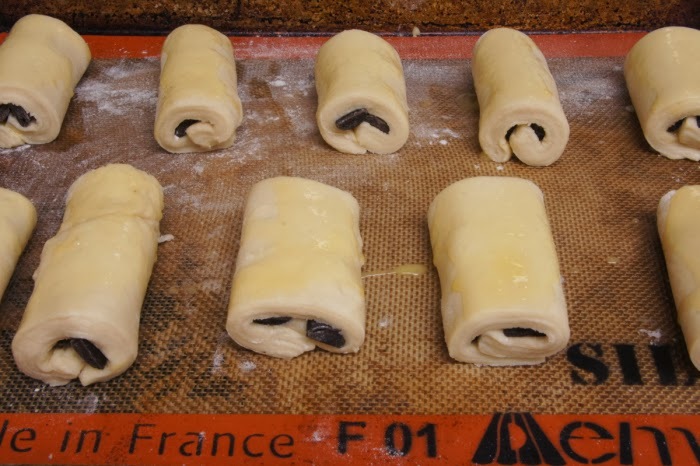 Case in point: rolling out the croissant dough to 19 x 9 inches, so that one could trim the edges for a 17.5 x 8 rectangle that could then be divided into ten equal rectangles for the chocolate croissants. Also, the trimmings made a nice bonus traditional croissant. Chocolate batons or chocolate pieces used for the chocolate croissants can be found at Spun Sugar in Berkeley. The croissants had shatteringly crispy outer flaky layers, and were buttery, rich, and delicious. Read the full post on his blog.